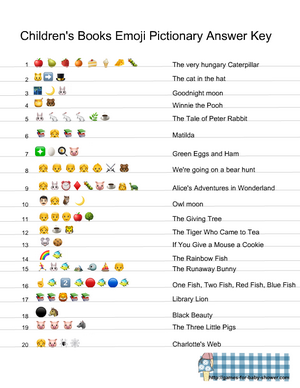 Children's Books or Kid's Books Emoji Pictionary Quiz is a new and very popular game. On this page I am sharing Free Printable Children's Books Emoji Pictionary Quiz in three different colors. I am also sharing an answer key to this game at the end of this page. The guests will have to guess the names of 20 very popular books for children's literature with the help of the clues given in the form of Emoji. How to Play: Print and distribute these Children's Books Emoji Pictionary Cards among your baby shower guests. Give a pen or pencil to each guest as well. 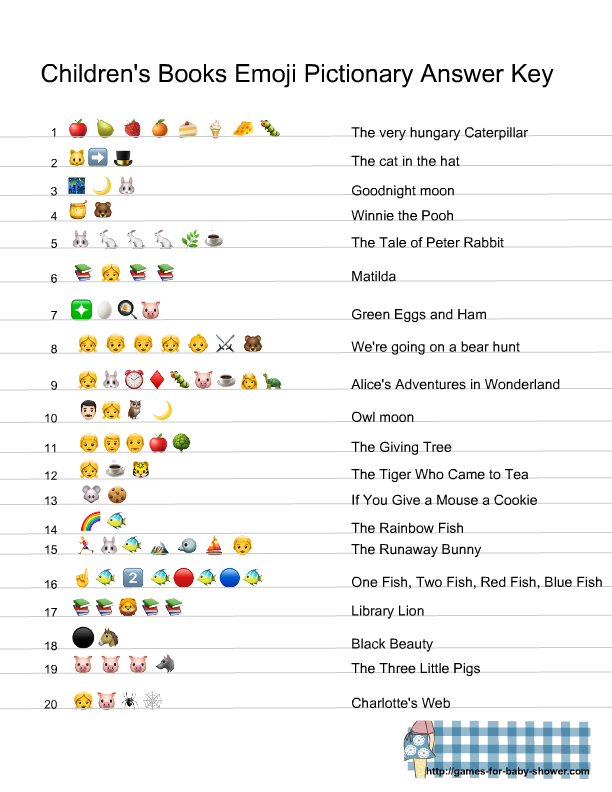 Ask the guests to guess the name of a popular children's book with the help of these Emoji. The person who gives all the answers correctly will be the winner. This is the first free printable image for this Children's Books Emoji Pictionary Quiz. It has a title written in funky colors and there are 20 different clues given in this quiz. You should click on the thumbnail of this game and the bigger printable image will open up. You cand download it on your computer, tablet or cellphone. Click on the image given above to get the bigger version of this blue Baby Shower bingo card so you can use it for your boy Baby Shower party. These cards will match just any theme that you are having for your boy Baby Shower. Here is another printable image for this children's books emoji game. It has it's title written in pink color. You can save it just the way I have mentioned above. 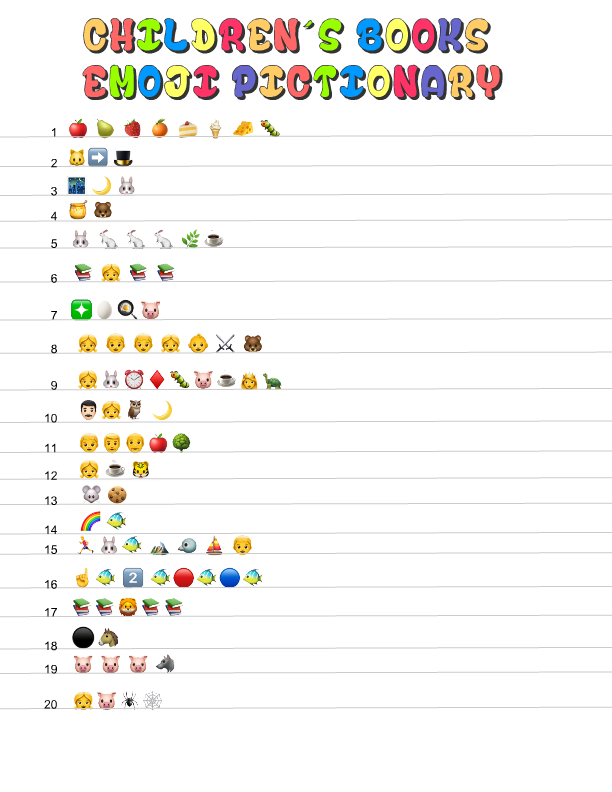 Here is a free printable answer key to this Children's Books Emoji Pictionary Game. You will only need just one copy of this answer key. You can also just keep it in your phone to check the answers given by the guests.